Finally, a bed heating and cooling system that allows works with any size mattress. The temperate can be programmed to be change during different hours or the night. Or, you can use its wireless remote control to set the temperature. 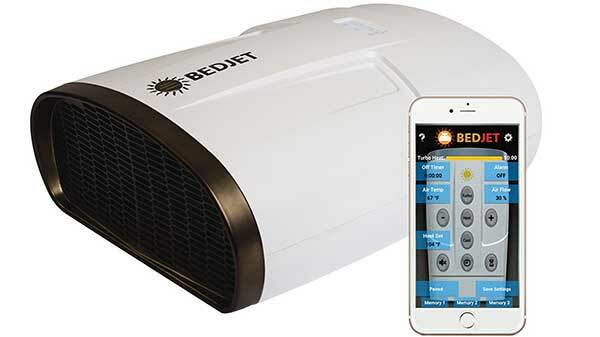 With the BedJet V2 climate control system you can say goodbye to night sweats and restless nights. BedJet has introduced biorhythm technology to help you fall asleep faster, stay asleep, and wake up more refreshed. For those that sweat, the ventilation system wicks moisture from the bed, leaving you dry and comfortable. The temperate can be controlled hour by hour, so if you find there is a certain time you keep waking up sweaty, you can lower the temperature around that time. For some people it is much easier to fall asleep when their sheets are cooled. Perfect gift for people who sweat when they sleep, have hot flashes, or just want to be able to cool or heat their bedding. For couples where one partner is always hot and the other is always cold, you can purchase the upgrade to have dual climate control. Each side of the bed will have independent temperature control.